The blue miracle. 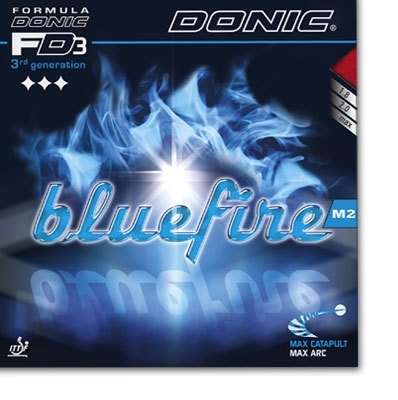 The new DONIC Bluefire rubber range is a completely new rubber development offering top speed and spin as a result of the perfect combination of the large pored blue sponge with an extremely spinny top surface rubber. Bluefire M2 has a medium hard sponge which results in excellent balance between speed, catapult effect and feeling. Recommended for offensive players that like to play with a slightly softer rubber with a lot of spin and still fast. Highly recommended rubber for attacking players who want great spin and speed but also great feeling from Medium hard sponge. probably the only rubber out there as good as, and in many respects, better than t05. this rubber has it all, better spin than t05, and certainly more penetration power and speed, whilst retaining immense control. nice rubber. i need it.